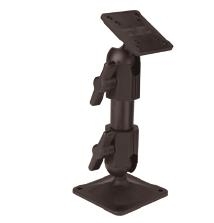 OUR VALUE PRICED PEDESTAL MOUNTS! AMPS-compatible. Knob and set-screw adjusting options included. • Concave foot design evenly distributes the mounting load for maximum stability and eliminates "carpet float"